The 2015 publication of ANSI/ASHRAE 188-2015, Legionellosis: Risk Management for Building Water Systems, fundamentally changed how Legionnaires’ disease is handled in the United States. In 2017 the Centers for Medicare and Medicaid Services mandated that all hospitals and long-term care facilities implement a water management plan to reduce the risk of Legionnaires’ disease, referencing ANSI/ASHRAE 188 as the basis for such plans. This fundamentally altered the standard of care for preventing diseases caused by Legionella and other waterborne pathogens in healthcare settings. The amount of data these water management programs generate quickly becomes overwhelming. The approaches often used to manage this mountain of data are to collect less data or to only evaluate data points in isolation, both of which ultimately hinder our ability to understand the condition of water systems. ANSI/ASHRAE 188 provides little guidance on sampling and interpreting measurement results, and provides no guidance at all on how to plan and carry out a Legionella risk assessment. While guidance exists on interpreting some of the parameters used to control Legionella growth, a practical tool to assess the combined efficacy of multiple parameters has not previously been available. To address this challenge, I developed a multivariate model to evaluate the combined effectiveness of control measures against Legionella and other waterborne pathogens in building potable water systems. The model allows users to evaluate a water system’s susceptibility to Legionella amplification and to prioritize corrective actions or improvements for systems found to be at high risk. Interpretation of water sampling results for Legionella is beyond the scope of the model but can be used to validate the effectiveness of control measures. Table 3.1 of the AIHA guideline “Recognition, Evaluation, and Control of Legionella in Building Water Systems” offers criteria for interpreting the results of Legionella water sampling to determine whether amplification is occurring. RESOURCES AIHA: Recognition, Evaluation, and Control of Legionella in Building Water Systems (2015). American Society of Heating, Refrigerating and Air-Conditioning Engineers: ANSI/ASHRAE Standard 188-2018, Legionellosis: Risk Management for Building Water Systems (August 2018). Annals of Clinical and Laboratory Science: “The Effect of Drying, Heat, and pH on the Survival of Legionella pneumophila” (May 1987). Applied and Environmental Microbiology: “Factors Influencing Survival of Legionella pneumophila Serotype 1 in Hot Spring Water and Tap Water” (May 2003). ASHRAE: Standard Guideline 12-2000, Minimizing the Risk of Legionellosis Associated with Building Water Systems (February 2000). ASTM International: D5952 – 08, Standard Guide for the Inspection of Water Systems for Legionella and the Investigation of Possible Outbreaks of Legionellosis (Legionnaires’ Disease or Pontiac Fever) (July 2008). BuildingGreen.com: “The Surprising Connection Between Water Conservation and Deadly Infections” (December 2014). CDC: “Sampling Procedure and Potential Sampling Sites: Protocol for Collecting Environmental Samples for Legionella Culture During a Cluster or Outbreak Investigation or When Cases of Disease May Be Associated with a Facility” (June 2015). CDC: “Toolkit for Developing a Water Management Program to Reduce Legionella Growth & Spread in Buildings: A Practical Guide to Implementing Industry Standards” (PDF, June 2017). CDC: “Vital Signs: Deficiencies in Environmental Control Identified in Outbreaks of Legionnaires’ Disease—North America, 2000–2014” (June 2016). Centers for Medicare & Medicaid Services: “Requirement to Reduce Legionella Risk in Healthcare Facility Water Systems to Prevent Cases and Outbreaks of Legionnaires’ Disease (LD)” (July 2018). Clinical Microbiology Reviews: “Legionella and Legionnaires' Disease: 25 Years of Investigation” (July 2002). Current Microbiology: “Measure of Legionella pneumophila Activity in Situ” (March 1981). Environmental Science: Water Research & Technology: “Critical Review of Mathematical Approaches for Quantitative Microbial Risk Assessment (QMRA) of Legionella in Engineered Water Systems: Research Gaps and a New Framework” (March 2016). EPA: “Effects of Water Age on Distribution System Water Quality” (PDF, August 2002). EPA: “Health Risks from Microbial Growth and Biofilms in Drinking Water Distribution Systems” (June 2002). EPA: “National Primary Drinking Water Regulations: Stage 2 Disinfectants and Disinfection Byproducts Rule” (PDF, January 2006). EPA: “Technologies for Legionella Control in Premise Plumbing Systems: Scientific Literature Review” (September 2016). Federal Register: “National Primary Drinking Water Regulations: Disinfectants and Disinfection Byproducts” (PDF, December 1998). Holland Water: “The Efficacy of Various Disinfection Methods against Legionella pneumophila in Water Systems: A Literature Review” (PDF). International Biodeterioration & Biodegradation: “Environmental Factors Affecting the Colonisation of Cooling Towers by Legionella spp. in South Australia” (1993). National Research Council: Drinking Water Distribution Systems: Assessing and Reducing Risks (2006). Water Research: “Impact of Advanced Water Conservation Features and New Copper Pipe on Rapid Chloramine Decay and Microbial Regrowth” (March 2012). Water Science and Technology: “Legionella and Public Water Supplies” (November 1988). World Health Organization: “Legionella and the Prevention of Legionellosis” (2007). BACKGROUND Regulatory pressures to reduce energy and water consumption, and to limit exposures to potentially carcinogenic disinfectant byproducts, coupled with an aging potable water distribution infrastructure, have preceded record rates of Legionnaires’ disease across the United States (see Figure 1). Between 2015 and 2018, publications from ASHRAE, CDC, AIHA, and the Centers for Medicare and Medicaid Services reversed past recommendations regarding waterborne pathogens and began advocating a proactive approach to prevent Legionella amplification. These changes focused on implementing water management programs in healthcare operations and other “at-risk” facilities, and include recommendations to periodically measure water temperatures, disinfectant or oxidant levels, and other parameters believed to influence the amplification of Legionella in building water systems. Some publications direct that a risk assessment be performed to identify where Legionella and other waterborne pathogens could grow and spread in the facility water system. However, only the AIHA guideline defines the parameters of a Legionella risk assessment and provides a framework for how to plan, conduct, and interpret the findings. AIHA Guideline Undergoing Revision Since the May 2015 publication of AIHA’s guideline “Recognition, Evaluation, and Control of Legionella in Building Water Systems,” several other guidelines, standards, mandates, and regulations have been issued. To ensure the AIHA guideline on Legionella remains relevant, AIHA’s Indoor Environmental Quality Committee has begun the process of updating and revising the guideline. The anticipated completion date is early 2020. Scores calculated by the model can range from zero to six. The score is a calculation of a potable water system’s resistance to Legionella amplification. With as little as two measurements (temperature and oxidant concentration) and one observation (oxidant type), a conservative score can be calculated. A greater number of distal points included in the risk assessment along with additional measurements and observations collected at each point generates a more robust score that is more reliable and repeatable. Explanations of Ceff scores appear in Table 1. PRIORITIZING ACTIONS Aggregating Ceff scores to assess a whole system, such as the hot water system, can provide a more useful and relevant characterization. It is important not to combine scores of independent systems: the resulting aggregate score would not reflect either system and could obscure a poorly controlled system due to bias introduced from a well-controlled system. Aggregated Ceff scores can be used to initially evaluate various water systems as part of a Legionella source risk assessment and be tracked over time. Water systems and sources with low Ceff scores may be prioritized for further assessment, corrective measures, Legionella-specific sampling, or all of the above. The variability of Ceff scores throughout a system can indicate areas of deficiency or a system that is inherently at greater risk. Data outliers from the mass of data should prompt investigation of the underlying reason. Examples of corrective actions may include increasing hot water storage and circulating temperatures, removing dead legs, or increasing the flushing frequency of effective dead legs. Other changes to water systems to reduce the risk of Legionella growth can include re-routing cold-water lines to prevent warming; increasing oxidant concentrations through increased water usage or adding supplemental disinfectants; or implementing preventative maintenance of key system components. A DEFENSE AGAINST LEGIONELLA Each control factor is essentially a “brick” in the defensive “wall” against Legionella growth in a potable water system. The size and strength of each brick adds to the overall effectiveness of the wall to prevent Legionella amplification. An effective wall can be built with a single brick if it is large enough, but it may not be as resilient as a wall built with multiple defensive components. This analogy forms the basis of the scoring system developed to assess the risk of Legionella amplification. While a low Ceff score does not definitively predict Legionella amplification, it does mean that the water source is more susceptible to amplification. A high Ceff score, especially one that trends over time, is a strong indicator that control measures, if maintained, are effective at preventing Legionella growth. Little published guidance is available regarding prioritization of control measures for preventing Legionella amplification. This model provides a data-driven method to assist competent professionals and water management teams with decisions about allocating time, personnel, and resources to manage water systems for Legionella. J. DAVID KRAUSE, PhD, MSPH, CIH, is the national practice leader in Toxicology and Risk Assessment for Forensic Analytical Consulting Services (FACS) in Tallahassee, Fla. From 2008 to 2011, he served as the state toxicologist for the Florida Department of Health. He co-authored the 2009 “Guidelines for the Surveillance, Investigation, and Control of Legionnaires’ Disease in Florida” and the 2015 AIHA “Guideline for the Recognition, Evaluation, and Control of Legionella in Building Water Systems.” Send feedback to The Synergist. Legionnaires’ Disease Cases Continue to Rise Despite the publication of numerous standards, mandates, and regulations in response to increasing rates of Legionnaires’ disease across the U.S., rates of disease continue to rise. Since 2002, the number of Legionnaires’ disease cases has increased five-fold. 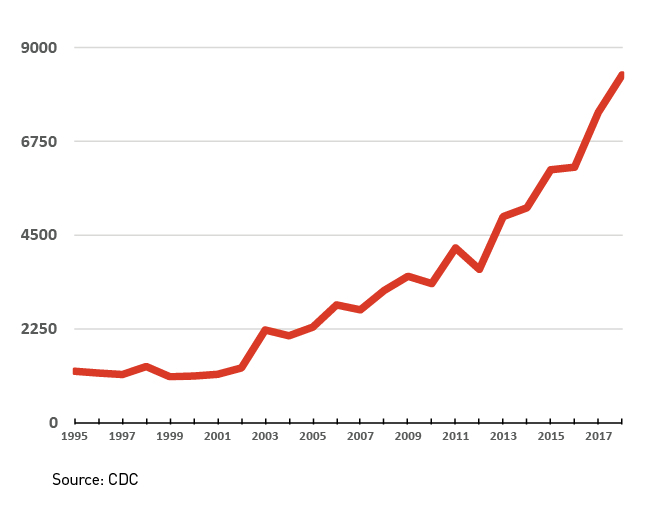 The total number of cases reported to the CDC in 2018 (8,356) exceeded the number reported in 2017 (7,458), an increase of 12 percent. Most healthcare facilities were mandated to perform risk assessments for Legionella sources and implement water management plans to prevent disease caused by Legionella and other waterborne pathogens in June 2017. However, these efforts have not yet resulted in abatement of the upward trend in disease. Regulations requiring cooling tower operators in New York City and New Orleans to register, maintain, clean, test, and report Legionella contamination have also been enacted. In light of new requirements and an emerging standard of care for operators of buildings and cooling towers to prevent conditions that lead to outbreaks of Legionnaires’ disease, the ongoing increase in cases should prompt all stakeholders to reevaluate their programs and operations. The influence of external factors such as climate change, rainfall amounts, disinfectant levels in supply water, and degrading equipment and infrastructure has not yet been fully assessed. Industrial hygienists should be prepared to assist communities in addressing this growing and complex issue. PDC on Legionella Assessments to be Held at AIHce EXP 2019 A PDC at AIHce EXP 2019 in Minneapolis will present the tools needed to perform Legionella risk assessments for building water systems. Topics include conducting Legionella risk assessment; measuring water quality, disinfectant levels, pH, temperatures, and other parameters; and planning for initial, routine, and outbreak assessments of building water systems. Case studies and video footage will be used to demonstrate specific techniques, methods, and analyses. The half-day PDC will be held May 23, 2019. For more information, visit the conference website. Tap on the equation to open a larger version in your browser.